I spent 17 years teaching accounting in various universities and colleges, specializing in cost and managerial accounting. Never was a tax guy, never too interested in auditing, didn’t particularly care for the financial statements gig. I did have a natural draw toward the world of cost accounting and how important this type of knowledge was for managers and others working in all sorts of businesses. Cost/benefit analysis is one example of the techniques that are typically found in the skill set of a cost accountant. It’s almost always an imperfect analysis, with several different ways that costs can be computed and where determining benefits is often nothing more than an informed opinion. So let’s see what I got for my $600, before adding in peripherals and apps. I got a touch screen, check. I got decent battery life, check, but that’s mainly true if you completely power it down after using it, which I don’t. The shortcomings of the iPad are well documented all over the web, except that most of them tend to end with something like this: “But still, it’s so cooooooool !!! Cool is just not enough for me, at least not in this instance. Let’s see what I didn’t get. No USB ports that would be oh so handy. Can’t print from the iPad. Glossy screen with lots of glare. Major eye strain coming down the pike. Not easy to hold – slippery and difficult to position comfortably while holding. The virtual keyboard is not very good. I hate being dependent on iTunes for anything. Needs to be web-based, not a client that I have to install on every device I own or even just try on for size. How exactly do I import my photos onto this thing? The battery will need to be replaced someday, oh that’s right, I can’t do that either. 4:3 screens are so 2001. I’ve heard so many fanboys try to spin the single-tasking thing as a feature or advantage. Give me a break. You’re telling me that it’s not possible to listen to Pandora while I check my email and that’s a good thing? I can’t have Tweetdeck open and type something into Evernote without constantly shutting one down to open the other? That’s not at all useful or efficient. A couple of weeks ago I was finally able to replace my old smart phone with a Motorola Droid. The Droid impresses me at every turn. It seems like a much higher quality device than the iPad – and yes, I’m sure that the Johnny Appleseeds reading this are rolling their eyes and retching at such a statement. I really feel that I got my money’s worth on the Droid, but don’t feel that way at all regarding the iPad. Undoubtedly I’ll get hate mail for my final comparison. I realize that the iPad and the Xbox 360 are two very different things with very different intended uses. But since I have two young boys who are begging for an Xbox 360, even though we already have a Wii (okay, two of them) and they each have Nintendo hand-held game systems as well. So they really want an Xbox, but I’ve been trying to resist it. They have spent many hours on my iPad and think that it is uber-cool, but they are perfect examples of why I find the iPad so lame – they watch YouTube videos and play a couple of very lame games that were free apps. It’s just a $600 toy. So what would we get with an Xbox 360 (the newest version)? The base price for the Xbox 360 is $300 ($299, actually), or half of the cost of the unspectacular iPad. 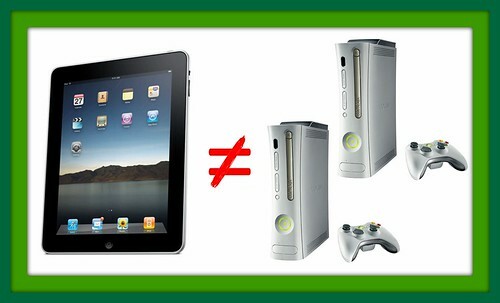 As you can see in the graphic above, I certainly don’t think that the iPad is worth two Xbox 360 units. I also hope that my kids don’t figure out that their old man spent $600 of their inheritance on this little piece of nothing instead of $300 on an Xbox. Don’t tell them, please. One last thing. No doubt many people will think this is just a pro-Microsoft and anti-Apple rant. Not true. In fact, one reason that I haven’t bought an Xbox is because it comes from Microsoft. I’m not a big fan of either one of these Hal-like companies. All I’m saying is that considering what you get for your money, either the iPad is a terrible value or the Xbox is a great value, or both. BTW (or another last thing), based on what I’ve been reading, I’d probably consider a PS3 over an Xbox, but the cost/benefit analysis in comparison to the iPad is pretty much the same either way. I’m not interested in debating the Xbox vs. PS3 question; take that somewhere else.